Since its founding in 2005, the Sport Management (SPM) Club at Syracuse University, a student-run organization in the Falk College’s Department of Sport Management, has donated nearly $200,000 to local Central New York charities. 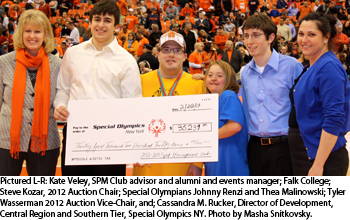 As a result of its most successful annual sport auction held in December 2012, the SPM Club made a $35,239 gift to Special Olympics New York, the largest donation ever generated from the auction’s eight-year history. The presentation was made at the Syracuse University men’s basketball game against Providence on Feb. 20. The SPM Club’s donation will help fund 88 athletes’ participation in Special Olympics for an entire season. As the largest amateur sports organization internationally, Special Olympics provides year-round sports training and competition for individuals with intellectual disabilities. Although no athlete, parent or caregiver ever pays to participate in Special Olympics New York, the cost per season, per athlete, is approximately $400, which is fundraised through events including Polar Plunge™, Law Enforcement Torch Run™, grants and community fundraisers. More than 55,698 athletes in New York train and compete in 22 Olympic-type summer and winter sports, with approximately 2,000 athletes from the Central New York region participating in training clubs and competitions throughout the year. “Special Olympics New York, our athletes, coaches and fans thank Syracuse University for its commitment to the local community. The practical experience gained through events such as the Charity Sports Auction offers students a unique opportunity to connect with the community while making a monumental impact beyond their four years in Syracuse. For nonprofit organizations like Special Olympics New York, $35,239 will sponsor and change the lives of 88 athletes. For students, this event will change their knowledge of the difference we can each make in the world when we share our individual talents,” says Cassandra M. Rucker, director of development, Central Region and Southern Tier, Special Olympics New York. “Each year our students exceed expectations, but their hard work, the donations and in-kind services of literally hundreds of companies and the support of SU fans who generously bid on the more than 560 items that were available, made this year’s event a truly special one,” says Kate Veley, manager of alumni and events in the Falk College and the SPM Club advisor. Other local charities supported by the SPM Club’s auction proceeds in previous years have included the Syracuse Boys and Girls Clubs, the American Diabetes Association of Central New York, the Upstate Golisano Children’s Hospital, the CNY SPCA and Ronald McDonald House Charities of CNY. The SPM Club has been annually recognized since its inception in 2006 with a Chancellor’s Award for Public Engagement and Scholarship, and received the inaugural 2009 Orange Circle Award from the SU Alumni Association to honor SU alumni, friends, faculty, staff and students who have achieved extraordinary accomplishments in support of others.